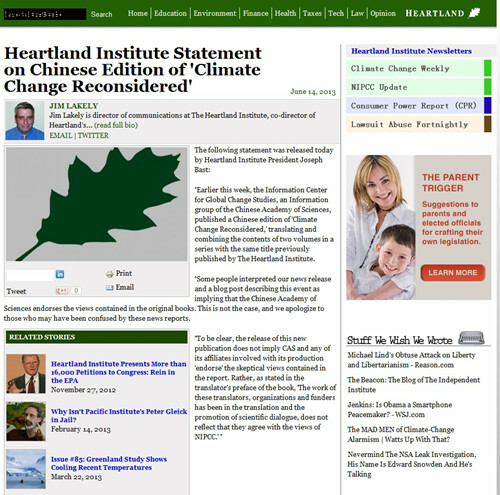 Heartland Institute Clarifies Misleading News Release on "Climate Change Reconsidered -- NIPCC Report"
"Earlier this week, the Information Center for Global Change Studies, an Information group of the Chinese Academy of Sciences, published a Chinese edition of 'Climate Change Reconsidered', translating and combining the contents of two volumes in a series with the same title previously published by The Heartland Institute." "Some people interpreted our news release and a blog post describing this event as implying that the Chinese Academy of Sciences endorses the views contained in the original books. This is not the case, and we apologize to those who may have been confused by these news reports." "To be clear, the release of this new publication does not imply CAS and any of its affiliates involved with its production 'endorse' the skeptical views contained in the report. Rather, as stated in the translator's preface of the book, 'The work of these translators, organizations and funders has been in the translation and the promotion of scientific dialogue, does not reflect that they agree with the views of NIPCC.' "